All of my 4 Caminos I used the same backpack from 2009 (which I bought before my first Camino de Santiago). For the first Camino I saw zero deterioration on my backpack, it was quite comfortable and had enough space for my all stuff (as for my first Camino I put toooo much stuff). Now my backpack survived more than 3000 km of my hiking trips and as well I use it sometimes for shorter hikes/trips, but it’s still in a pretty good shape. The only problems I had was with zippers, nothing else. The size of your backpack. For Camino de Santiago you do not need to big backpack as you won’t (hopefully) carry too much additional stuff or clothes, so don’t bother buying those big 80-90 liters backpacks as you wont need that much space. And those bigger backpack weight much more as well. 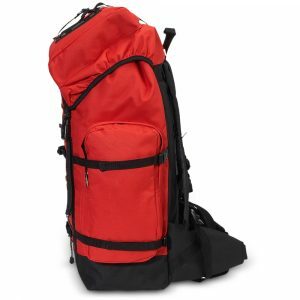 My best suggestion is to buy a bacpkack from 45 liters to 65 liters max. If you prepare everything very carefully, you most definitely can fit all your stuff in 45 liters. I even saw some hikers who used school bag size backpacks with all their stuff inside 🙂 And it’s no problem at all if you plan ahead. Most of the professional backpacks have such additional stuff like: rotating hip belt, adjustable chest strap, at least two entries into the backpack or even an internal pocket to keep a hydration bladder. Entries to backpack – some of the backpacks have at least two different compartments. I always use the lower one on the bottom to put my sleeping bag. It is very useful because while hiking you may need some stuff from your backpack: a jacket, shorts, a sweater or something, so the sleeping won’t block the reach to that stuff 🙂 And as well it is very comfortable to put it right into that compartment in the morning. Some backpacks have the zippers on the side of the backpack, so you do not have to open the top of the backpack and can reach anything you need from there. That is very useful feature as well. My backpack is not waterproof. Other solution is to buy waterproof backpack cover which is quite cheap and helps a lot as well. I use that one now. If backpack is not for life, it’s at least for 10 years or more 🙂 And if you save too much today, you may regret it in the future if your backpack is not too comfortable or tears very fast. I know that I spent very little on my first backpack, but if I were to buy a new one today, I would definitely go for more comfort than less price.